This is not a pregnancy pact, but a lovely coincidence taking place at one elementary school in Goddard, Kansas. Out of the 15 total teachers at Oak Street Elementary, seven of them are expecting babies sometime between March and October of 2019. The school shared the news with their Facebook followers. When fourth grade teacher Tara Johnson was the seventh person to find out she was pregnant, she went and told her boss. She said principal Ashley Miller was flabbergasted. "I was sitting down at my computer, and I had turned around and said to her, 'Are you kidding me?' Then, I had to tell her congratulations," said Miller. One of the women is even pregnant with twins, meaning a total of eight babies are joining the Oak Street Elementary family. "To me, it just becomes comical because like it was a lot when there were three of us and then there were four of us and then there were five of us and then there were seven of us, so it just kind of became funny to me at that point," said Johnson to KSN. "One of the things the Goddard School District talks about a lot is being one big family. That's one of the things that they really push and really strive for and so this kind of proves it," said Kelli Jo Sheahon, one of the other moms-to-be-the one who is expecting twins. Meanwhile, principal Ashley Miller joked that it might be a good investment to add a nursery to the school. Miller has already found long term substitutes to fill the positions of the roughyl half of her staff who will be gone on maternity leave for the near future. "What we really need right now is a sponsorship from, like, Pampers or Huggies or somebody," she joked. The women, though bewildered at the coincidence, say they're happy to be experiencing pregnancy and motherhood together. We will be sending well wishes to Goddard, Kansas for safe births and happy motherhood! 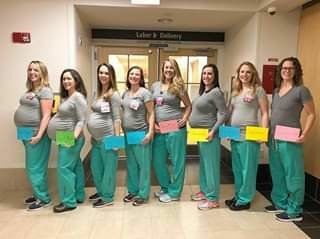 Meanwhile in Maine, NINE labor and delivery nurses at Maine Medical Center in Portland, Maine are all expecting. The hospital shared the news with a photo of eight of the nine. "How's this for a baby boom? Nine of our nurses (8 of whom are in this photo) are expecting babies between April and July! Congratulations!" The story was picked up by Good Morning America.